On 23 and 24 October 2014, EU’s Heads of State will determine Europe’s future action to avoid dangerous global temperature rise. At this important date, it is expected that they will propose to reduce Europe’s domestic greenhouse gas emissions by 40% below 1990 levels by 2030. Of course, this proposed target is not nearly enough to drive the transformational progress that Europe needs in our fight against climate change. However, some governments and industries are trying to water down Europe’s climate action even further. They want to use the loopholes in our current climate framework in order to undermine Europe’s future climate ambition. These loopholes have led to a 4 billion hot air bubble that is currently putting a dark shadow over EU’s 2030 climate target because it could be directly transformed into future rights to pollute. Without immediate and urgent action, this carbon bubble would effectively cause that the actual emissions reductions under a 40% target may be as low as 26%[i]. The 4 billion rights to pollute are distributed between the two policy instruments: the EU’s Emissions Trading System (EU ETS)[ii] and the Effort Sharing Decision (ESD) [iii]. By the year 2020, European countries are expected to have accumulated around 1.3 billion unused pollution credits under the Effort Sharing Decision, which sets out yearly reduction targets for each country. This is because predictions show that the actual greenhouse gas emissions will remain below the EU’s targets in each year during the 2013-2020 period. This results in a carbon credit surplus in the ESD equal to around 600 million tons of CO2-eq[iv]. The build-up of the carbon surplus is the outcome of weak targets and will not be the result of additional reduction efforts by countries. EU member states can also purchase more than half of their overall reduction obligations through carbon credits from offsetting projects in developing countries. This means that member states are allowed to use up to 750 million offsets until 2020[v]. So in total by 2020, there could be a hot air bubble equal to 1,35 billion tons of CO2-eq in the ESD due to weak targets and the use of international offsets. Some countries have indicated their wish to carry-over their hot air into the 2030 climate framework. To avoid that these 5% of phantom rights to pollute are undermining the proposed 40% target, heads of state should instead agree to disallow the banking of surplus. More than 2 billion excess carbon allowances are currently undermining Europe’s carbon market and its efforts to address climate change. By 2020, the accumulation of spare pollution permits are expected to further accumulate to 2.6 billion excess carbon credits. [vi] The surplus under the EU ETS could sabotage Europe’s climate efforts for decades to come, as the excess allowances are automatically carried-over into the 2030 climate framework. This would transform the oversupply of carbon permits into more rights to pollute after 2020. Under the EU’s carbon market the hot air is automatically carried-over in the 2030 climate framework. 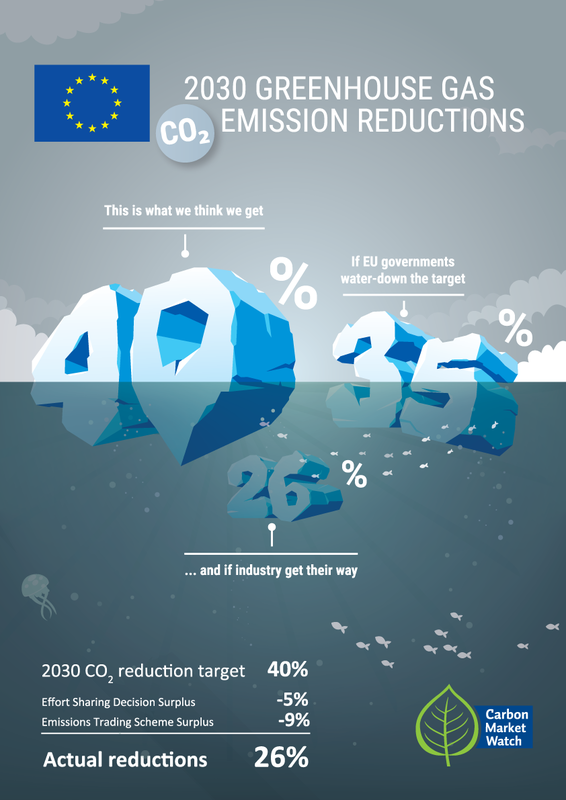 To avoid that these 9% of phantom rights to pollute are undermining the proposed 40% target, Heads of State should agree to permanently cancel the excess carbon allowances by tightening the EU ETS caps. Email: Your Minister or Member of European Parliament. 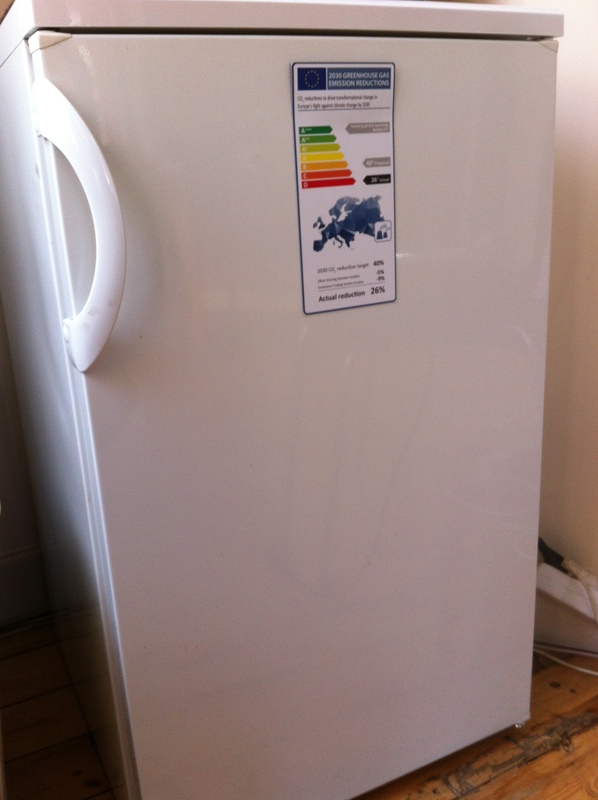 Download and Stick: the EU_loopholes_label in your office refrigerator, take a picture and share on social media with the hashtags above and support the call for action in Europe! 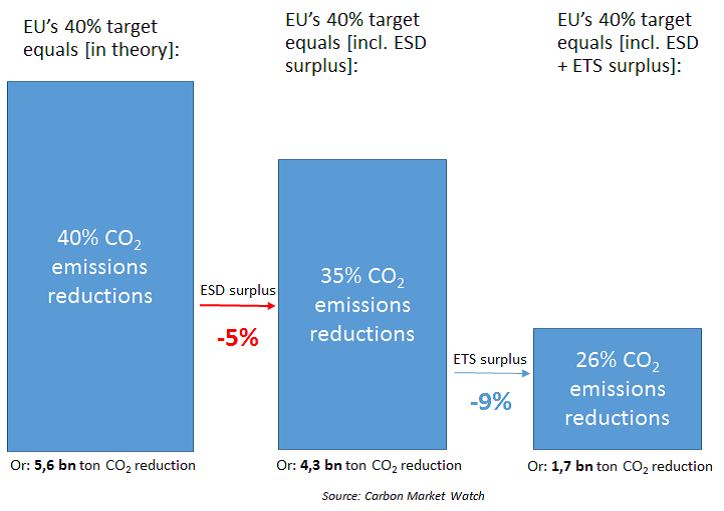 [i] Calculation with the assumption that the 3.95 billion surplus is used for compliance in the 2020-2030 period, and assuming that EU-28 1990 emissions equaled 5.626 million tons of CO2 (EEA, 2014). [iii] For more information on the ESD, see our policy briefing “Tackling 60% of the EU’s climate problem” here.